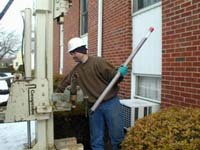 At the request of the Department of Environmental Protection, Loureiro Engineering Associates, Inc. collected soil samples at the Christian Tabernacle Baptist Church on Newhall Street on February 10 and 12, 2004. Soil samples were taken to find out if there is waste or harmful substances in the soil that would cause problems for the Church’s upcoming construction project this spring. Soil samples were labeled and sent to a laboratory for testing. The kind of testing done at the church - the equipment used, sampling procedures and laboratory analyses - is the same as what will be done at homes in the Newhall neighborhood. The following photographs show how the testing was done. This machine used to collect soil samples is called a Geoprobe®. A Geoprobe is a large hydraulic hammer that pounds a metal cylinder into the ground. Because it works by using a lot of pressure to push the cylinder into the ground, the The Geoprobe can be placed very close to foundations and structures without causing harm. Holes dug by a Geoprobe are very precise and do not spread beyond the diameter of the cylinder used. For example, this 2 ½ - 3-inch wide hole was dug in the parking lot of the Christian Tabernacle Baptist Church. The Geoprobe was able to dig through the pavement to a depth of 16 feet without cracking the pavement around the hole. Inside the Geoprobe’s metal cylinder are plastic tubes that collect soil. Each tube is 1 ½ inches wide and 4 feet long. The Geoprobe collects a 4-foot long soil sample each time it is placed in the ground. Testing was done at the church to a depth of 16 feet. This means four separate tubes were used at this sampling location to collect soil at different depths between the ground surface and 16 feet below the ground surface. Testing in the Newhall neighborhood will be done to different depths using the Geoprobe, depending on how deep waste is found. Depending on soil conditions, the Geoprobe can take samples to a depth of 20 feet or more below the ground surface. A technician is removing plastic tubing from inside the Geoprobe’s® metal cylinder just after it has been lifted from the ground. Note the different color caps on each end; they help keep track of the depth of each soil sample. 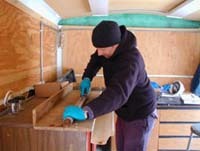 Once a soil sample is removed, it is brought to a mobile trailer on site to be examined, sorted and labeled before being brought to a laboratory for testing.First, each plastic tube is cut in half. Each four-foot tube is divided into two sets for taking samples, with two samples for each set. The location (depth and area) of each sample and what the sample looks like is recorded. 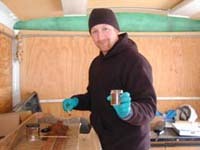 The technician will sort through the sample to identify the type of soil, debris and other visible characteristics. The soil sample is also tested for odors. Each sample is numbered and placed in glass jars. In this case, one set of samples is tested for organic compounds, the other for metals. These samples were sent to the state DEP’s mobile laboratory for preliminary metals testing using a hand-held, X-ray fluorescence device. After review of these results, a decision is made which samples should have full laboratory analyses done for metals and other substances at a state-certified lab. Many soil samples taken in the neighborhood will initially be tested using X-ray fluorescence. Then, private labs certified by the state will be used to fully analyze the soil samples. DEP and the laboratories have quality control standards for all testing, and DEP will monitor private testing by performing its own random tests on the same soils tested privately to make sure the results are correct.